The silk flowers I had on our dining table had been there for several months. I decided that they looked a little too holiday-ish, but I was not ready to switch to springtime colors yet with all that snow still on the ground outside. 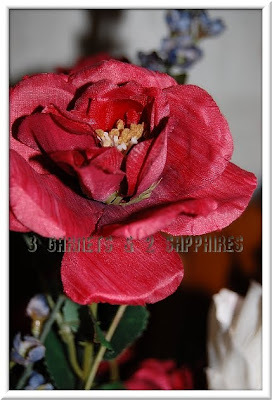 So, I purchased some new silk flowers including a few stems of this red one. The overall color scheme is red, ivory, and blue. I was pretty pleased with how the arrangement turned out, although I wish I had purchased one or two more stems of the red and the ivory flowers.